This is not your older brother’s Of Montreal. After one listen to the group’s latest, Hissing Fauna Are You The Destroyer, fans of Of Montreal prior to 2004’s Satanic Panic In The Attic will be shocked to learn this is the same outfit that produced the expansively twee, carnival-esque albums The Gay Parade, and Cherry Peel. The degree in separation in both sound and atmosphere could not be more decidedly different. Having toiled in what Of Montreal’s leader and chief songwriter, Kevin Barnes, has described as the “indie ghetto” for nearly ten years, Barnes took the reins of the group in 2004 ending an era of Elephant 6 styled mass group collaboration. Having complete creative control in terms of songwriting, sound and production what emerged was the beat heavy, electropop-synth watershed Satanic Panic In The Attic. 2005 saw Barnes further chase his new muse on The Sunlandic Twins mining varied genres until ultimately spinning them into one of his own. Part three of Barnes’ creative trilogy Hissing Fauna is the logical next step in terms of sound, but with an added layer of personalization and introspection not so readily and immediately available on prior efforts. When he emotes on the track “A Sentence Of Sorts In Kongsvinger,” “I spent the winter on the verge of a total breakdown while living in Norway” backed by the incredibly poppy and upbeat instrumentation it’s as if you wonder whether to laugh or cry with him. Such is the duality of Hissing Fauna. Fifty plus minutes of clever, clever pop saturated in what sounds like a man on the brink of a nervous breakdown. It also may very well be Of Montreal’s best work yet. Here are seveteen seconds from Of Montreal’s “Gronlandic Edit,” one of my favorite musical moments of 2007 thus far. Of Montreal’s Hissing Fauna drops today…. 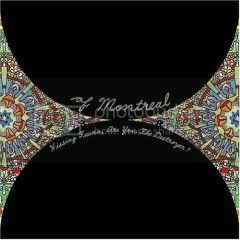 + Of Montreal available through eMusic’s 25 Free MP3 trial offer. + Visit The Hype Machine for additional Of Montreal MP3s.